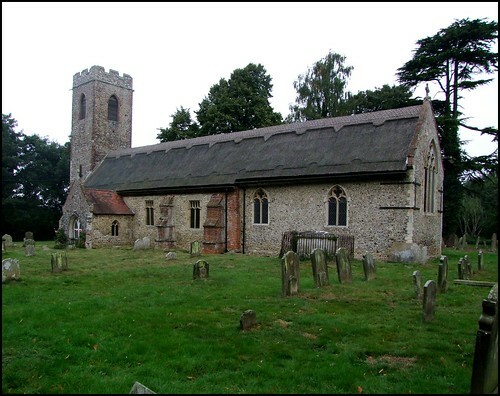 East Anglia has not far short of 1,500 medieval parish churches, and so it is not surprising that some do not appear to be as well known as they should be. Take St Botolph, for example, tucked away in an area of locked churches to the west of Lowestoft. The first time I ever came here, I had cycled from Barnby, with which North Cove forms a joint parish, a mile further up the awful A146. Although I had my trusty OS map, it took me a couple of sweeps to even find this church, secluded as it is on a closed road just beyond the pub. You have to go through a metal gate to reach it. It must be said that St Botolph has the happier situation of the two churches, the road by-passing Barnby village now; but at one time it went right past this churchyard. The wide former road ends just to the east of the church, but a footpath will carry you on to Barnby, and to St John the Baptist there. North Cove is so-named, apparently, to distinguish it from South Cove. But South Cove is miles away, and takes its name from the fact that it is a mile south of Covehithe. Probably, this place was simply Cove before the roads and railways came - and the railways have gone, now. The eccentric flint and red brick tower is rather pleasing beside the solid Norman nave, which is betrayed by the splendid south doorway. Decorated windows punctuate the walls, but they seem a little awkward, as if they didn't want to be quite so far apart - a bit like the perpendicular windows at Wissett, away to the south. How delightful, to enter a previously unvisited church! What on earth might we find inside? It may be, this far north, that it has escaped the kind of Victorian restoration that renewed so many churches around Halesworth and Eye. Perhaps there will be an interesting and unique feature, like the banner-stave locker door at nearby Barnby. Or, perhaps, it will all end in disappointment; a deadly affair of whitewash, pitchpine benches, and off-the-peg Minton tiles. But, of course, I'm teasing you. For here, on the walls of the lengthy chancel, we will find (did you guess?) some of the finest surviving medieval wall-paintings in all East Anglia. They are remarkable for their quality, their condition and their extent. "Aha! ", I hear you exclaim, as you cross-refer to your Cautley and your Pevsner; "They were all repainted by the Victorians!" Well, it is certainly true that the heavy-handed Victorians went over them in oil, thickening lines, filling in gaps, and generally making them more medieval than they were already. But, in the 1990s, this Victorian restoration was painstakingly removed. Also removed was dirt, plaster and later wall-texts, to reveal something that I find breath-taking.. The wall paintings are in the chancel of this narrow building. On the north wall is the story of the Passion of Christ. The nailing of Christ the Cross and the deposition are particularly outstanding. One mysterious feature, which you might just miss unless you look for it, is a tiny figure arising from a coffin, set high on the wall to the west. A figure in a coffin sits and watches it all. The 1990s restoration of the scroll in the figure's hands reveals it as the donor of this extraordinary work. Opposite is a mighty depiction of Christ in Judgement. The serious-faced Messiah sits on a rainbow, overseeing the separation of sinners and virtuous on the Last Day. The Blessed Virgin and St John look on, as St Michael makes the judgements. Beneath, the dead arise from their coffins and await their fate. The paintings almost certainly date from when the chancel was new, in the early 14th century. They were painted over, probably a hundred years before the Reformation, when the new windows were inserted. Roundels containing evangelical texts were applied over this in the 17th century, and they were uncovered by the well-meaning Victorians, who revealed and nearly ruined them. And today, they are restored to their original vibrancy. You would travel to the V&A in London if they were there, and pay good money to see them. So why not come here and see them in situ, and give your money to these good people instead? The 15th Century font seems relatively large in this narrow space. Sam Mortlock thought it was so like those at nearby Mutford and Gisleham that it was probably carved by the same mason. The hooks above the 19th Century screen may be medieval, and might have been used for securing the lenten veil above the rood. Other than that, not much survives from earlier times in what was a relatively pleasing 19th Century restoration, leaving the interior with a definite rustic air. A sad note is injected by the war memorial. One of the boys on it is the Vicar's son, the splendidly named William Woodthorpe Barnard Barnard-Smith. He was killed during the later stages of the Battle of the Somme in October 1916. He was twenty-one years old.